Do the White Tulip next to the Sun Flower look like the Moon 🌖and the Sun☀️? It does for my imagination!!! 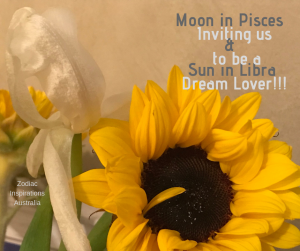 The Moon🌖 in Pisces♓ is inviting the Sun☀️ in Libra♎ to embody fantasy… Pisces is about transcendence – beyond relationship and Libra is about relationships. Dream Lover ❤️would be a good definition of this combination. Is rounded with a sleep”. The Sun changes to Scorpio on 23 October 2018 and then on 25 October 2018 @ 3:45 am we will have the illumination of the Full Moon in Taurus to connect with the beauty life! !